Jay Kogan is a man who is buried in Springfield Cemetery. 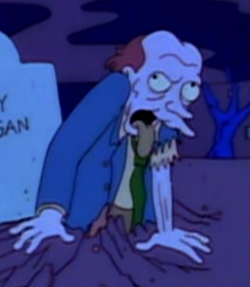 When Bart tried to get Lisa happy by trying to resurrect Snowball I for her, but accidentally reanimates hundreds of human corpses instead, one of whom was Jay Kogan. It is likely he returned to his grave again once the spell was undone. His name is a parody of writer Jay Kogen.